It’s been a long journey, but one which has been worthwhile in asserting the CFCV as not tolerating policy decisions affecting you, being made behind our backs. Many of you have already kindly donated to our fight, which we are grateful for, and has helped us get this far. Our point all along has been that the role of Victoria Police is to enforce the law, not make it. What makes it worse, is that Victoria Police are represented at meetings of the Firearms Consultative Committee which was set up to test proposals to update our laws – but bypass it when it suits them. It is a very disrespectful thing to do. Click here to see the blog where this all started. This started with the Victoria Police telling the Herald Sun in March 2016, that it had made ‘recommendations’ for firearm law reform to the state government. All without any consultation with the shooting community. So we FOI’d the Police on what these recommendations were. 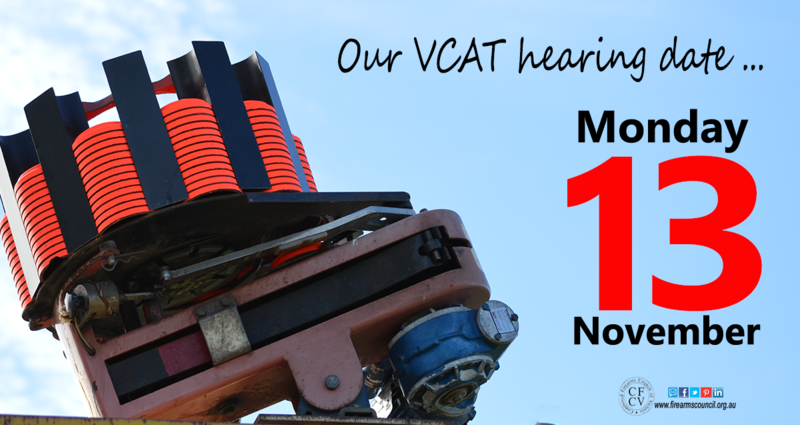 They would not tell us, so we hired a lawyer and a barrister to launch our appeal though VCAT in May. Since then we’ve had a Directions Hearing, a Compulsory Conference and in recent days, the gathering of statements from both sides which will be put ‘into evidence’ at the hearing. This is clearly one of the most important fights Victorian shooters have been involved in for some time, which has only been made possible through the support we have received from individuals, like yourself. Click here if you’d also like to sponsor this action. If you’d like to stay up to date on the action, click here to join our email list if you aren’t already on it. You can opt-out at any time.